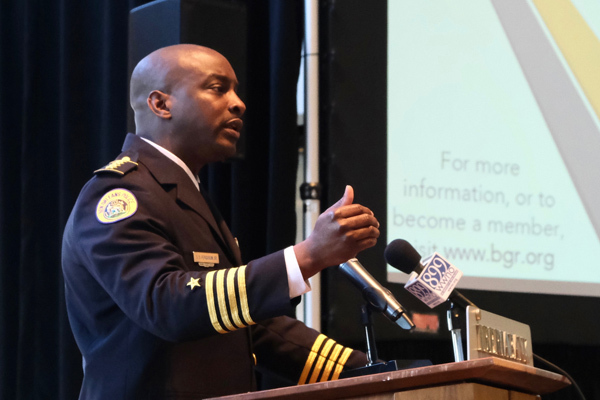 New Orleans Police Superintendent Shaun Ferguson delivered an optimistic assessment Wednesday of the department he’s led since mid-January. Chief Ferguson told the nonprofit Bureau of Governmental Research that he expects the department to complete reforms outlined in the 2013 Federal Consent Decree within three years. He says NOPD’s reputation has risen from one of the nation’s worst to one of the best – and that crime statistics are proof of progress. “As we approach the end of the first quarter of 2019 we’re 51 percent down in murders. We’re achieving another double-digit reduction in armed robberies. This will be our fourth year in a row in doing that,” Ferguson said. He credits youth outreach programs and improved efficiency. The federal monitor said in January that “substantial work” remains to be done before oversight is removed. Ferguson says he is committed to running an efficient and constitutional force.